Could a plane with an electric turbine engine generate enough lift to provide a electric areodynamic lift and runway to space? This question is similar to my previous ones but configuration is different and so is the question. 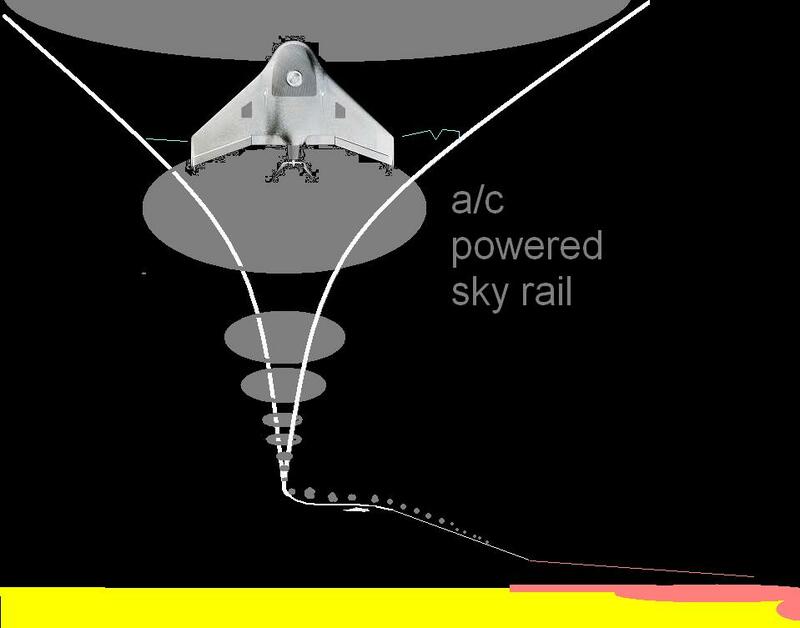 Could a modified electric turbine engine (E-Fan) plane create enough of its own lift not to burden an electric rail that is evenly supported by electric powered blimps and rail (similar to a 3rd rail of a train) while carrying a payload (like the space shuttle) to the edge of space? The problem with a high power electric engine is the is the supply of electricity and weight of the engine and battery . The blimps and rail are necessary to provide the amount needed without a huge battery. Rockets still can be used at the end of it. Assuming maximum altitude for the highest blimp is 74,000 feet, and the rail to be angled at 15 degrees, it gives us a rail length of 285,000 feet. The HiSentinel stratospheric airship flew that high, and was able to carry only 36 kg. The steel rail/rope would weigh roughly 5.5 million kg. Based on steel density and a good sized rope, to withstand the elements. So we'll need 154,000 blimps to carry the rail. That's 1 blimp every 2 meters. Blimps are huge. While the idea is highly imaginative (good thing), engineering tends to solve problems, not create ones. Would the blimps (if they fit in the sky) power down between launches? Or stay aloft? [A] Lockheed L-1011 TriStar that was modified to be used as a mother ship launch pad for Pegasus rockets. As of June 2012, 35 rockets have been launched from it. RE: How much lift could an electric engine powered plane provide if the power source was provided externally? What you are asking is like having a plane not carry fuel and instead have a long fuel hose attached to a fuel pump on the ground. Ignoring all the problems associated with that, one will help you understand the problem: pumping the fuel. Pumping electricity over such a long wire / rail will require high voltage / low current (just like power lines). Which means the E-Fan-like plane and all the blimps will need to carry their own super heavy transformers (as I wrote above, one high-altitude blimp lifts 36 kg, which we've already used for lifting the rail). A basic problem you have with this design is weather - what do you do when a storm passes through? Due to their large surface area, your blimps at lower altitudes are going to be pushed around a lot by high winds, probably to destruction. Storms, and the associated high winds, can extend upwards of 40k feet, in extreme cases. You might think about getting the electricity to the aircraft by other means, perhaps microwave transmission. Well, its going to be a question, not if one could do that, but whether it makes more sense to use a simpler system such as Paul Allen's StratoLaunch or Orbital's Stargazer / Pegasus systems. First, let's ask ourselves why design an all electric powered aircraft to provide a mother ship for launching rocket payloads into orbit or beyond? 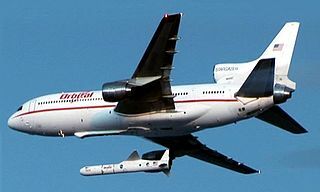 The primary advantages of a reusable mothership/daughtercraft runway to orbit system is it allows you to take advantage of the air in the atmosphere to boost your payloads through the lower layers of the atmosphere by using the existing air as a working fluid as well as making use of atmospheric oxygen to oxidize chemical propellants, reducing the need for large rocket engine and boosters to clear the lower atmosphere, greatly saving the amount of money it costs to launch a unit mass into orbit. Adding an electric propulsion system potentially can create a more environmentally friendly launch system, depending on the methods used to generate the electricity to power the craft. So supposing we use an all electric version of Allen's Stratolaunch system. It's powered by six PW4000 engines, each with a specific fuel consumption of 0.583 lb per hour / lb thrust. With the engines producing 56,750 lb thrust, this gives us a fuel consumption rate of 6 x 56,750 x 0.591 = 90,232 kg/hr of JET-A fuel. Typically for an electric motor, their power consumption is roughly 1/3 of that of a hydrocarbon engine per unit of mechanical power out of the driveshaft. Given this fact, assuming any a 100% efficiency for propellers and/or fans, as well as the energy density of JET-A fuel is approx 45 MJ, an electric aircraft of this type would be consuming about 1.35E12 J/hr = 376 megawatts of electric power to haul this kind of an aircraft and payload into launch position at high altitudes. Typically electric power is transmitted by means of high voltage lines, operating in the 250,000 - 500,000 AC volt range. Assuming these lines and load offer a zero impedance load, this requires these lines transmit a 750 - 1500 amps of current to carry that kind of power. Typically Aluminium-conductor steel-reinforced cable heavy enough to carry that kind of power weight about 800 lbs per 1000 ft of cable. Using this and not taking into account for the additional structure needed to support and separate the lines to prevent flashover arcs and system failure, we will need a lifting system which can support approx 8000 lbs per mile of power lines needed (remember we need at least two lines). Assuming we use helium balloons to support these lines and helium has a lifting capacity of 14.49 cu ft per pound lifted, we will need balloons of approx 115,920 cu ft per mile of lines needed. This is roughly on par with a Goodyear sized blimp on each mile marker to support this system. Another problem with balloons supporting the lines is there is no way to prevent the balloons from drifting together under the weight of the lines sagging, further defeating any effort to suspend the lines at altitude. And this doesn't even begin to take into account for the problems of departing and maintaining contact with the line throughout the flight, effects of weather on the lines, servicing and maintenance, etc. Bottom line, a scheme like this is physically feasible but its excessively complicated and expensive when there are far simpler alternatives for this kind of a space transport system. Honestly with a complex design like this, you would be far better off simply launching the rocket and payload aloft under a helium balloon (it would have to be really big! ), letting it reach 100,000 or so feet then releasing and igniting the rocket on its final flight into orbit. But even that is far less feasible then a hydrocarbon powered mothership. If you’re searching for a more environmentally friendly solution, I’d consider a Stratolaunch fueled using biodiesel. It would be a zero net carbon solution and would work well here. Abandon a crazy scheme like a sky rail; back of the envelope calculations just show it’s not feasible. Can balloons be stacked in a climable daisy chain to the edge of space? Could a blown wing ever be powerful enough to lift an aircraft at zero forward velocity? Can an airplane fly with greater weight than lift and how? Can this design provide more lift force than thrust from engine? Could reduced-lift wingtips allow an airplane to generate less wake turbulence?